If you enjoy these Steinbeck facts, check out our bumper collection of famous author facts. 2. In the 1980s, a rumour arose that Steinbeck’s novel The Grapes of Wrath had been translated into Japanese as ‘The Angry Raisins’. This rumour was, however, false. It is a good example of how people love a good ‘lost in translation’ story, and it has been debunked numerous times. 4. Steinbeck wrote a book about King Arthur. It’s an unlikely topic for the author of Depression-era novels, but Steinbeck’s sortie into Arthurian fantasy was penned late in his career. Like T. H. White (who wrote the sequence The Once and Future King, beginning with The Sword in the Stone) and Tennyson (who wrote a long verse-novel, Idylls of the King, in the nineteenth century), Steinbeck drew on Sir Thomas Malory’s vast fifteenth-century prose epic, Le Morte d’Arthur, for his source material. Steinbeck’s Arthurian fantasy was The Acts of King Arthur and His Noble Knights. Begun in 1956, the book was left unfinished upon Steinbeck’s death in 1968, and was not published until 1976. 5. He wrote one of the finest love letters in all of literature – a letter about falling in love. In this letter of 1958, Steinbeck responds to a letter his son Thom had written to him. Thom had told his father that he had fallen desperately in love with a girl named Susan (at this time, Thom was away at boarding school). Steinbeck’s tone is supportive and honest throughout, taking his son’s feelings into account but also offering advice on ‘what to do about it’ – surely what every teenager in the first pangs of a love affair wants to know. ‘The object of love is the best and most beautiful,’ he tells Thom. ‘Try to live up to it.’ He ends the letter by assuring his son, ‘And don’t worry about losing. If it is right, it happens – The main thing is not to hurry. Nothing good gets away.’ You can read the letter in full here. If you enjoyed this post, check out our compilation of interesting Mark Twain facts. You might also enjoy our facts about William Burroughs, J. D. Salinger, and Harper Lee. Image: John Steinbeck’s poem plaque near the City Lights Bookstore in San Francisco Chinatown’s Jack Kerouac Alley; author: Goodshoped35110s; public domain. Thank you so much, Susan! That’s great of you to say. More posts to come! Also nuts. Don’t forget nuts. This is fantastic! I read it aloud to my coworkers who share my love of literature! We loved it!! Reblogged this on I don't make the rules, I just make the coffee.. Thanks for your always fascinating posts. Love that letter from Steinbeck to his son. Thanks, Erich! I know, that letter is simply all kinds of marvellous. I thoroughly enjoy the Five Facts series that Interesting Literature features regularly. This John Steinbeck one is wonderful – especially if you take the time to go to the link showing the full text of the letter to his son Thom. Wonderful. Steinbeck is my favorite author. One of his lesser-known works is called Sweet Thursday. I love this book. When Steinbeck’s father died, he said he wasn’t so much sad about his death but sad about his life. I had just read Sweet Thursday when I read the biography. Got me thinking about some of the story in Sweet Thursday. Thanks for mentioning Steinbeck today Interesting Lit! Great post. Steinbeck actually stated that his King Arthur book he believed was the best thing he ever wrote; unfortunately, even though I am a lover, scholar, and author of Arthurian books myself, I can definitely say it was not. I have to confess that his King Arthur book is the only Steinbeck I’ve read, and that only out of duty. It’s strange in that it starts almost as Malory transcribed into modern English, slowly morphing into a more genuine response to the human characters involved. I can see why he didn’t finish it: I myself am not inclined to revisit it after my first and only acquaintance in the mid-70s. What a truly beautiful letter Steinbeck wrote to his son about falling in love. He must have been a loving father and how lucky Thom was to have him. This gives us another window into Steinbeck. No wonder he wrote with such compassion. Thanks for this post and all your other posts. Ah thank you for the link to that wonderful letter. I didn’t know whether to laugh or cry at the first, dog, anecdote. ‘The dog ate my homework’ was an implausible, fictitious excuse I once tried to use . It wasn’t believed. If only I had known about Of Mice and Men, I would I’m sure have proffered my excuse with more conviction! Maybe someone should write a novel with that title, as some sort of postmodern joke. Now I say that, perhaps someone already has! What a fascinating post. I couldn’t appreciate TGoW when I read it for high school history, but I’d like to take it up again as an adult. In any case, Steinbeck was one of America’s finest writers, from novellas (OMaM, Cannery Row, Red Pony, etc.) on up. Thanks, Leigh! Glad you enjoyed it. I once passed up about half a dozen Steinbeck novels in a charity shop, including The Grapes of Wrath; I’ve always regretted it. I need to read more: those I’ve read (especially the shorter novellas, such as Of Mice and Men) I’ve really enjoyed. I’d recommend to anyone who hasn’t read Steinbeck to start with the short stories and novellas such as Of Mice & Men and Red Pony. Both very moving; he seems to convey emotion without too much sentimentality. Excellent. Thank you. I’ve just started reading East of Eden for the first time. What a treat! Thanks, Ashley! I’d be interested to hear your thoughts on East of Eden, as I’ve not yet read that. Sometimes I’m such a twit! I’ve already read East of Eden, it’s The Grapes of Wrath that I’m reading now. I loved East of Eden, it’s full of complex characters. The Grapes of Wrath I’m not enjoying so much: so grindingly bleak. Hi, your blog’s original and fun. It must take a lot of research. Thanks for following my blog and don’t hesitate to comment. As always, a delight to read this and I learned a great deal. I remember reading Of Mice and Men in my school days and it was possibly the first book I’d read where the ending shocked me. I didn’t see it coming. I wish I’d known about the dog back then – that would have been hilarious! Thanks, Ken! I know exactly what you mean about Of Mice and Men. Steinbeck didn’t pull any punches! It had the same effect on me. I know: every schoolchild deserves to know about that story – especially those writing their homework on Of Mice and Men! His book on King Arthur is actually really good, but I have to confess that my favourite Steinbeck is Travels With Charley, about his road trip around America with his dog. Beautiful evocations of place and people – made me want a road trip of my own. Great post. Always great to read about Steinbeck. Also reminded me I have a copy of that King Arthur book I picked up second hand lying around. Will have to fish it out and give it a read. I love this post about John Steinbeck, especially since it’s his birthday today! My favorite: East of Eden by John Steinbeck. Love Steinbeck, darling. Thanks for sharing this. Fascinating stats, thanks for sharing. 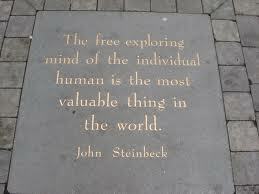 I love Steinbeck! I really loved that last fact about the love letter to his son. Wonderful! If my dog ever ate one of my drafts, I’m not sure I’d ever be able to look at him the same again. There are some things man’s best friend should never do. I just love reading your work. He is one of the greatest! Reblogged this on annala62's Blog.